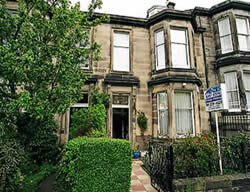 Menzies Guesthouse is located in the heart of the city of Edinburgh. The Menzies Guesthouse is only a short walk away from Princes Street, Edinburgh Castle, King’s Theatre and all main attractions. We offer single, double, twin-bed, triple and family rooms at extremely economical rates. All rooms come with TV, tea and coffee-making facilities, ironing and hairdryer. Menzies Guest House has 7 rooms on 3 floors and convenient parking for a number of vehicles. We offer a warm, friendly atmosphere and a sturdy breakfast. Set in a lovely Victorian terrace, the Guest House is only a short walk to Princes Street, Edinburgh Castle, Kings Theatre, the Conference Centre and all the main attractions. You can make a booking directly from our website using our secure booking facility, but please first make an enquiry using our enquiry page, or by calling us on 0131 229 4629. You can get a closer look at the standard of our accommodation by clicking on most of the photos on the website, which will give you a larger size picture. We also provide self-catering. We have a very nice self-serviced apartments close to the guesthouse. Copyright Menzies Guest House in Edinburgh. All Rights Reserved.